Are you braiding or putting your hair in a ponytail while at the gym? Not protecting your hair while swimming? Should you brush your hair when it’s wet? Are you shampooing your hair frequently? Anabel Kingsley, Trichologist at Philip Kingsley has the reasons to why you might need to rethink these common lifestyle choices that could be damaging your hair. Swimming is a great way reduce stress levels and get in shape. “However chlorinated and salt water can be drying on your hair, especially African-Caribbean hair as it tends to be more porous” says Anabel. 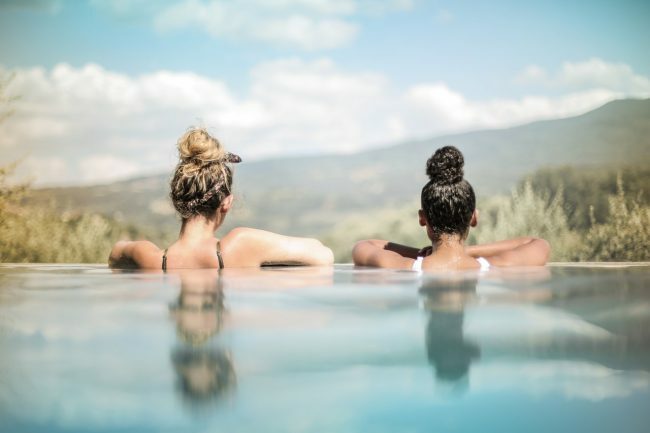 It is important to protect your hair whilst swimming or restore lost moisture and elasticity after swimming, otherwise this could lead to further damage. Is it bad to brush wet hair? Anabel Kingsley notes that “it’s ok to brush your hair when it’s wet, but as wet hair is naturally weaker than dry hair it’s important to be gentle.” “When detangling, start from your ends and work your way up. Starting from the top increases friction on the hair shaft and is more likely to result in breakage.” Make sure that you choose a brush with rounded, flexible plastic prongs as bristle brushes can tear off sections of the outer cuticle in a ‘string-cheese’ like fashion. Frequently shampooing your hair is essential for hair health and beneficial for hair growth. “Your hair, just like any other part of your body, does not clean itself” notes Anabel. “When you shampoo your hair, the act of massaging dislodges the loose hairs sitting detached in the follicle.” By stimulating the scalp, shampooing regularly can actually help reduce daily hair fall.